If you happen to live inside a cave you may not be aware that today, October 21 2015, is the day Marty McFly and Doc Brown land in the future, AKA Back to the Future day. The film franchise made numerous predictions of what the future would be like. Hoverboards aren’t quite in commercial use yet, but thanks to Nike self-lacing sneakers have arrived. 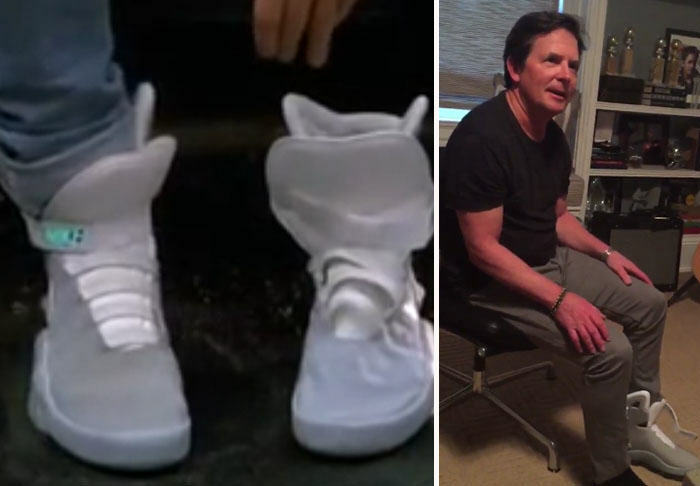 The sportswear giant delivered the first pair to Marty himself, as confirmed by Michael J. Fox’s twitter page. The self-lacing Air Mags in the video will not be the only pair either. Fox also tweeted a letter penned by Nike designer Tinker Hatfield who confirms more pairs will be produced and sold, with the proceeds going to the Michael J. Fox Foundation. Incredibly cool technology raising money for a great cause, everyone is a winner. Estimating a total higher than $9.4m (around £6.1m) they are clearly not going to go cheaply. If only I’d started saving 30 years ago.